It's more like a washer than a gasket, but it is made of a composite material... it's fiber, but also lightly magnetic. The part number is 11401-11432E as seen on this drawing from Cygnus. I've been to two dealers and they've gone through the supersessions, alternately saying no longer available and they will be here tomorrow. Nothing. I've also been to both of my favorite hardware stores. Nothing . Anybody have stock or suggestions? My engine and transmission are sitting there ready to go... for lack of a couple of gaskets. You had them searching these part numbers? If the part is discontinued here try and get it from overseas. Are you talking about the freeze plugs in the back? If so a machine shop should be able to help you get the right size. @Piratetip I'm not sure which numbers were ultimately searched. Several conversions were made, and several wrong parts brought to the counter. That's why I started out here today with the Cygnus numbers. The Cygnus catalog lists four possible engines, and this gasket is only used on the early NATO model (which I presume is North America Toyota). I got one of the plugs, and I saved one of the gaskets, was going to provide pictures but the system rejected every size file I tried to use. Thanks for the URL. That looks like the next logical move, but first, I will try to nail down the right part number. These plugs are screwed in and have a hex-head. 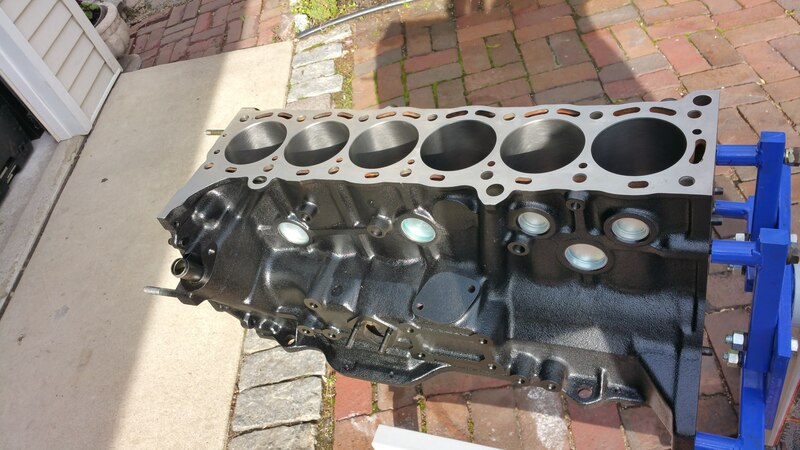 The other three engine models have them tapered and the block is tapered. In this model they are flat and the block is flat to match. I wouldn't call them freeze plugs, as if they froze and reacted it would ruin the block. @plaaya69 the plugs in question are on the other side of the engine and behind and/or below the starter motor. Great info here, but don't stop if you have more ideas I will research the overseas solution, but, hey, maybe someone has a source closer to home? If it’s tapped then just use a copper or alum crush washer. It doesn’t have to be fiber. I would still suggest a local machine shop for the right size crush washer and they should point you in the right direction. Even Napa should have a drawer full of copper crush washers on hand or have them pull out their big catalog book they should carry and they should be able to get you the right size you need. I am confused. 11432E is pointing to a freeze plug on driver side rear. How is that a threaded plug with gasket? By the way, if you limit x-resolution of your image to 800 pixels it usually uploads fine. In this model they are flat and the block is flat to match. There are four different parts catalogs and only one of them has the threaded plugs. (Mine). The block pictured is not my block. That's the plug and gasket to the right... Have one gasket, believe I have two plugs but can't find other at the moment. This early block, pointed out by pictures IJ posted (which are gone today) is the reason that I dropped my HP expectation to 500 rw. I have the early block and the early crank. Oh well. Can't view the image you just posted, too small. Upload the full resolution image to imgbb.com. Select BBCode FULL or Thumbnail, copy that link here to your message. Here is an example I just uploaded there. If you don't want to try and get the part overseas, plaaya69's suggestion is probably the best bet. Find you local hardware store or NAPA that has large selections (assortments) of crush washers. Just match it up to whatever they have for crush washers, Aluminum, Copper, Fiber they should all work. Edit: Your photo is working now. That gasket is quite large 41mm. The fact that I have both an early block and an early crank made me re-think my HP expectations. There's a pic of the threaded plug above in an earlier post. A much larger version of the photo is there now. In the old days we used PhotoBucket free accounts, spam and all. I deleted both accounts after getting to the point where I wasn't posting here. I realize that storage costs and all that, but sometimes I can upload sometimes I can't. I replaced that image you couldn't read with a larger one... the same size that would not upload earlier Go figure. I've been to Marshall's Hardware, and they usually have everything. I've also been to ACE, Home Depot and Lowe's. No luck. Two dealers, and at least one $60 invoice for a handful of pieces, the plug in the picture about over 14 bucks The owner of the local machine shop is a p****, so I just don't go there. Update: Chris Rhodes found me here and invited me to join his FB page: San Diego Supras. He also posted my request there, so I will wait a few days before trying @Piratetip 's suggestion. Yeah same here. Used to use Photobucket as well before they mucked it all up. Check NAPA, one with a lot of those universal parts selections. Or some other gasket equivalent should work. Coolant system only sees a Max of 14psi or so. Lowe's and HomeDepot don't have jack, I was just there looking for a small crush washer. They have nothing like that. Wow. Ok I get it now. I'm sure it was cheaper to use freeze plugs so that's where they went later. Some options that might work. Great options! Thanks. This will get knocked out soon. it is a PDF. Just look for the OD and ID to see what matches. They have a ton! These 2 from the Parker catalog look just about dead on. Why did you rule out WZ series washer? Its self centering, has an overmolded/vulcanized NBR or FKM inner elasomer sealing ring. Also those 2 part numbers have a burst pressure of 810 BAR! These are interesting as the metal section is not designed to deform and seal. The inner elastomer sealing ring does that. It is a different sealing design than OEM, but would work IMO. I would say they should work very well, as long as both sealing surfaces are clean and flat.